Air assault is the movement of ground-based military forces by vertical take-off and landing (VTOL) aircraft—such as the helicopter—to seize and hold key terrain which has not been fully secured, and to directly engage enemy forces. In addition to regular infantry training, air-assault units usually receive training in rappelling and air transportation, and their equipment is sometimes designed or field-modified to allow better transportation within aircraft. The US Army field manual FM 1-02 (FM 101-5-1) describes an "air assault operation" as an (DOD) Operation in which assault forces (combat, combat service, and combat service support), using the firepower, mobility, and total integration of helicopter assets, maneuver on the battlefield under the control of the ground or air maneuver commander to engage and destroy enemy forces or to seize and hold key terrain. Air assault should not be confused with air attack, air strike, or air raid, which all refer to attack using solely aircraft (for example bombing, strafing, etc.). Moreover, air assault should not be confused with an airborne assault, which occurs when paratroopers, and their weapons and supplies, are dropped by parachute from transport aircraft, often as part of a strategic offensive operation. Air assault should also not be confused with forms of military transport operations known as air landing, airlift, or airbridge, that all require an already secured place to land—an airhead. Air assault and air mobility are related concepts. However, air assault is distinctly a combat insertion rather than transportation to an area in the vicinity of combat. "Air assault operations are not merely movements of soldiers, weapons, and materiel by Army aviation units and must not be construed as such." 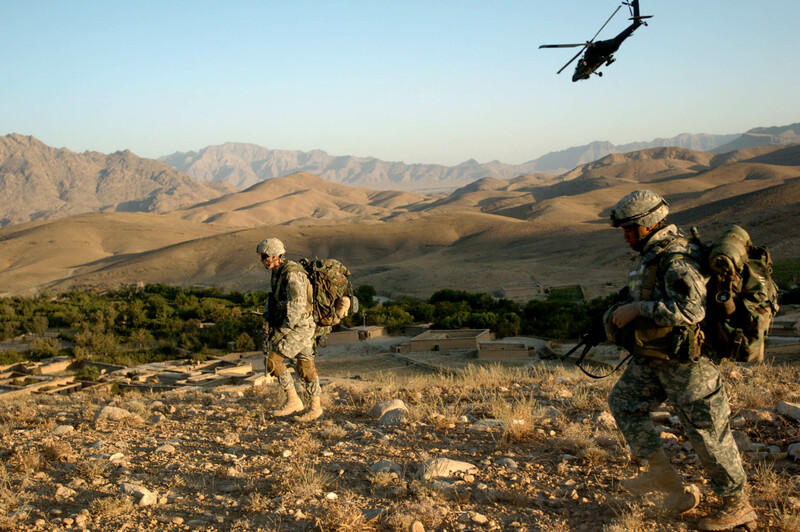 Air assault units can vary in organization; using helicopters not only in transport but also as close air fire support, medical evacuation helicopters and resupply missions. Airmobile artillery is often assigned to air assault deployments. Units vary in size, but are typically company- or brigade-sized units. Portuguese Paratroopers being launched from an Alouette III helicopter, in an air assault operation in Angola, in the early 1960s, during the Portuguese Overseas War. The first helicopter airlift and Helicopter Sling Load mission was conducted on September 13, 1951 during the Korean War. "Operation Windmill I" was conducted by the United States Marine Corps in support of a battalion clearing the enemy from a series of ridges around an extinct volcano called "The Punchbowl." In total seven HRS-1 marine helicopters made 28 flights that delivered 18,848 pounds of supplies and evacuated 74 seriously wounded men. On November 5, 1956 the Royal Marines' 45 Commando performed the world's first combat helicopter insertion with air assault during an amphibious landing as part of Operation Musketeer, in Suez, Egypt. 650 marines and 23 tons of equipment were flown in ten Westland Whirlwind Mark 2s of 845 Naval Air Squadron from the deck of the HMS Theseus, and six each Whirlwinds and Bristol Sycamore HC.12s and HC.14s off HMS Ocean's embarked Joint Experimental Helicopter Unit (JEHU) (Royal Air Force). The plan was to use the helicopters to drop No. 45 Commando at Raswa, to the south of Port Said, in order to secure two vital bridges. Last-minute concerns about their vulnerability to ground fire meant that they were replaced in this role by French paratroops who conducted a daring low-level drop on 5 November, securing one of the two bridges intact. Instead No. 45 Commando was landed the following day, disembarking close to the seafront in the aftermath of the seaborne landing that had secured the area. This first-ever operational use of helicopters to land troops during an amphibious assault proved successful. With their carriers lying nine miles offshore, the marines were landed far more quickly than could have been achieved using landing craft, and without the need to get their boots wet. However...they landed the marines in much the same place that old style landing craft would have put them." In 1956, the United States Marine Corps executed the first Division-strength exercise of vertical envelopment when the 1st Marine Division was helicopter-lifted from converted WWII jeep carriers to landing sites at Camp Pendleton, CA, U.S. Marine Corps Base. One of the ships utilized for this exercise was the U.S.S. Thetis Bay. This exercise was the culmination of the Marines' developing strategy of vertical envelopment rather than amphibious assaults on heavily defended beaches. The maneuvers were well-covered by the media of the time, including LIFE Magazine. The Marine Corps subsequently adopted this method as standard operating procedure after proving that helicopters could be used to transport very large numbers of troops and large amounts of supplies in a timely fashion. The use of armed helicopters coupled with helicopter transport during the Algerian War for the French Army to drop troops into enemy territory gave birth to the tactics of airmobile warfare that continues today. The machines of the French Army Light Aviation carried out a considerable number of missions against Algerian insurgents between 1955, when the Groupe d’Hélicoptères No.2 (GH 2) was created, and 1962 when the French empire in Algeria finally came to an end. GH 2 was based at Sétif - Aïn Arnat in the east of the country, and it was equipped primarily with machines to undertake transport missions, though the Vertol H-21C, would soon join the unit owing to concerns about the lack of machines which could both defend themselves and carry out offensive missions against the insurgents. Acquiring these machines lay in the hands of the licensee Piasecki given France’s urgent need to have them on account of the circumstances. Usually, the H-21 could carry up to 18 troops, yet local operating (as well as climatic) conditions decreed that the French army examples could carry only up to around 12 troops each. In two years, GH 2 received the vast majority of the H-21s acquired by ALAT, which consisted of five squadrons by the end of 1958. A sixth squadron from the French naval air arm, the Aéronautique navale, had operated with GH 2 for little more than a year. From 1955 to 1962, GH 2 took part in the major battles, which occurred near the frontier between Algeria and Tunisia, including the battle of Souk-Ahras in April 1958. The helicopters, including types such as the H-21, the Alouette II, the Sikorsky H-19 and Sikorsky H-34, together aggregated over 190,000 flying hours in Algeria (over 87,000 for the H-21 alone) and helped to evacuate over 20,000 French combatants from the combat area, including nearly 2,200 at night. By the time the war in Algeria had ended, eight officers and 23 non-commissioned officers from ALAT had given their lives in the course of their duties. U.S. Marine helicopter squadrons began four month rotations through Vietnam as part of Operation SHUFLY on 15 April 1962. 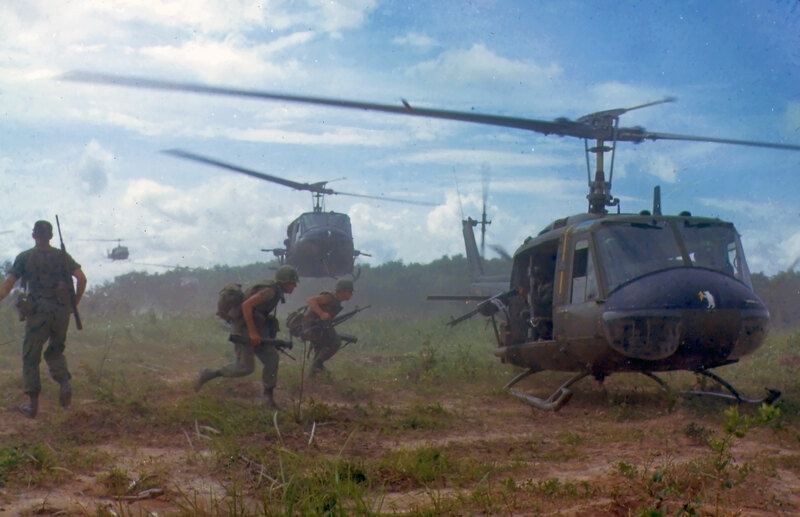 Six days later, they performed the first helicopter assault using U.S. Marine helicopters and ARVN troops. After April 1963, as losses began to mount, U.S. Army UH-1 Huey gunships escorted the Marine transports. The VC again used effective counter landing techniques and in Operation Sure Wind 202 on 27 April 1964, 17 of 21 helicopters were hit and three shot down. The need for a new type of unit became apparent to the Tactical Mobility Requirements Board (normally referred to as the Howze Board) of the U.S. Army in 1962. The Board met at a difficult time; the bulk of the military hierarchy were focused primary on the Soviet threat to Western Europe, primarily perceived as requiring heavy, conventional units. The creation of new, light airmobile units could only occur at the expense of heavier units. At the same time, the incoming Kennedy administration was placing a much greater emphasis on the need to fight 'small wars', or counter-insurgencies, and was strongly supportive of officers such as General Howze who were embracing new technologies. The Board concluded that a new form of unit would be required, and commissioned tests - but justified these at the time on the need to fight a conventional war in Europe. Initially a new experimental unit was formed at Fort Benning, Georgia, the 11th Air Assault Division on 11 February 1963, combining light infantry with integral helicopter transport and air support. Opinions vary as to the level of support for the concept within the Army; some have argued that the initial tests against the context of conventional warfare did not prove promising, and, despite opposition from the Joint Chiefs of Staff, it was primarily the Secretary of Defense Robert McNamara who pushed through the changes in 1965, drawing on support from within the Pentagon which had now begun to establish a counter-insurgency doctrine that would require just such a unit. Others have put more weight on the support of newly appointed senior Army commanders, including the new Chief of Staff General Wheeler, in driving through the changes. Nonetheless, the 11th Air Assault Division assets were merged with the co-located 2nd Infantry Division and reflagged as the 1st Cavalry Division (Airmobile), continuing the tradition of the 1st Cavalry Division. Within several months it was sent to Vietnam and the concept of air mobility became bound up with the challenges of that campaign, especially its varied terrain - the jungles, mountains, and rivers which complicated ground movement. The first unit of the new division to see action was the 1st Battalion, 7th Cavalry Regiment, led by Lieutenant Colonel Harold G. Moore. The 7th Cavalry was the same regiment that Custer had commanded at the ill fated Battle of the Little Bighorn. On November 14, 1965, Moore led his troops in the first large unit engagement of the 1960s Vietnam War, which took place near the Chu Pong massif near the Vietnam-Cambodia border. It is known today as the Battle of Ia Drang Valley, and is considered to be the first large scale helicopter air assault. This unit gave common currency to the U.S. term "Air Cavalry". Units of this type may also be referred to as "Airmobile" or with other terms that describe the integration of air and ground combat forces within a single unit. The armed forces of Portugal, Rhodesia and South Africa widely conducted airmobile warfare operations in Africa, during the Portuguese Colonial War (1961-1974), the Rhodesian Bush War (1964-1979) and the South African Border War (1966-1990). The airmobile warfare was part of the counter-insurgency actions made by the forces of the three countries against guerrilla forces in Angola, Portuguese Guinea, Rhodesia, Mozambique and South-West Africa. The airmobile warfare tactics used by Portugal, Rhodesia and South Africa had many similar characteristics. The air forces of the three countries also used the same types of helicopters (mainly Alouette III and later, regarding Portugal and South Africa, SA 330 Puma), and there were military cooperation agreements and sharing of experience between the three powers. These tactics often involved air assaults done by small units of special forces or light infantry, transported in four or five Alouette III helicopters. Assaults were often supported by an Alouette III armed with a side-mounted 20 mm MG 151 autocannon. This helicopter was nicknamed Helicanhão (heli-cannon) by the Portuguese and K-Car by the Rhodesians. Variants of the air mobile warfare tactics used in Africa included the Rhodesian Fireforce and the Portuguese heliborne-horseborne forces cooperation. Desert Storm - 101st Airborne's Rapid Refuel Point (RRP) capable of servicing 20 helicopters simultaneously. In the United States military, the air assault mission is now the primary role of the 101st Airborne Division (Air Assault). This unit is the Army's only division-sized helicopter-borne fighting force. Many of its soldiers are graduates of the Air Assault course qualifying them to insert and extract using fast rope and rappel means from a hover in addition to the ordinary walk on and off from an airlanded helicopter. The 10th Mountain Division Light Infantry regularly perform air assault operations, as do many other US Army infantry units. On September 19, 1994, the 1st Brigade of the 10th Mountain Division conducted the Army’s first air assault from an aircraft carrier, the USS Dwight D. Eisenhower, as part of Operation Uphold Democracy. This force consisted of 54 helicopters and almost 2,000 soldiers. This was the Army's largest operation from an aircraft carrier since the Doolittle Raid of World War II. All U.S. Marine Corps ground units are trained in basic air assault tactics and capable of performing helicopter borne operations that require them to fast rope from a hovering helicopter. The U.S. Marines also specialize in conducting air assault that launches from specialized helicopter carrying naval ships during amphibious warfare. ↑ "Air Assault Operations". www.globalsecurity.org. http://www.globalsecurity.org/military/ops/air-assault.htm. Retrieved October 12, 2013. ↑ Rawlins, Eugene W. (1976). Marines and Helicopters 1946-1962. Washington, D.C.: United States Marine Corps History and Museums Division. p. 20. ↑ Rawlins, Eugene W. (1976). Marines and Helicopters 1946-1962. Washington, D.C.: United States Marine Corps History and Museums Division. p. 35. ↑ Freedman, Lawrence Kennedy's Wars: Berlin, Cuba, Laos and Vietnam Oxford University Press: Oxford (2000) pp.334-5. ↑ Krepinevich, Andrew F. The Army and Vietnam John Hopkins Press: Baltimore (1986) pp.121-2. ↑ Krepinevich, Andrew F. The Army and Vietnam John Hopkins Press: Baltimore (1986) p.124. ↑ Whittle, Richard. "The Dream Machine: The Untold History of the Notorious V-22 Osprey" p41. New York: Simon & Schuster, 2010. ISBN 1-4165-6295-8. Retrieved: 6 August 2012. ↑ "Fireforce Operations". selousscouts.tripod.com. http://selousscouts.tripod.com/fireforce_operations.htm.